Originally published under the title "Yes, Walls Are Needed, and They're Already Everywhere." Le Pointe's border barrier infographic (click to enlarge). One may support or oppose the Trump administration's grand design in terms of home security: the building, or the "updating," of a 3200-kilometer barrier between the United States and Mexico. One cannot deny, however, that such structures – hermetic and heavily monitored separations, instead of merely classic borders – are quite common today. 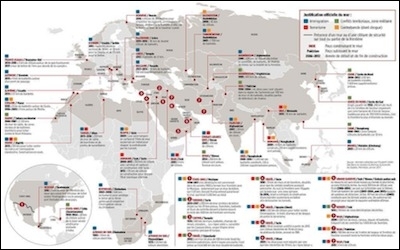 Le Point, a French right-of-center weekly, has published a comprehensive map in this respect. According to it, and other documents, the oldest existing barriers are the outcome of wars of aggression. The "demilitarized zone" (DMZ) between North and South Korea -- in fact, one of the most militarized fences in the world -- was created in 1953 as part of the armistice agreement that ended a three-year war initiated by the Communist North Korean regime. The 180-kilometer long Attila that separates the Muslim-Turkish populated Northern Cyprus from the Christian-Greek populated southern Republic of Cyprus was unilaterally set up by Turkey after it invaded the Mediterranean island in 1975. Hermetic and heavily monitored border barriers are quite common today. The Sand Wall, a 2720-kilometer barrier put in place between 1980 and 1987 and manned by 100,000 Moroccan soldiers, marked Morocco's 1975 unilateral annexation of the former Spanish colony of Western Sahara. 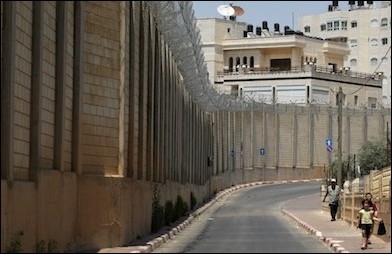 Likewise, the 120-kilometer fence on the Israeli-Syrian and Israeli-Lebanese borders and the 51-kilometer fence on the Israeli-Gazan line were set up in the wake of repeated aggressions by Arab states or terrorist organizations against the Jewish State from 1948 to 2014. The almost 3000-kilometer fence on the Indian-Pakistani border is the result of the many wars and skirmishes involving the two South Asian nations since 1947. 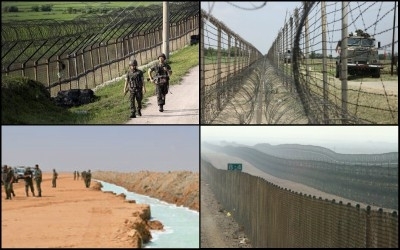 Clockwise from top left: The South Korean side of the DMZ, the India-Pakistan border south of Jammu, the Kuwait-Iraq security barrier, Tunisia's border with Libya. There is a 3300-kilometer wall between secular but Hindu-dominated India and Muslim Bangladesh. Some 2700 kilometers of walls surround Uzbekistan, 1400 kilometers lie on Saudi Arabia's borders, 1200 kilometers on Iran's Eastern borders, and 700 kilometers on Oman's borders. Jordan is completing a 500-kilometer fence on its Syrian and Iraqi borders; Tunisia a 200-kilometer fence along its Libyan border. China built a 1600-kilometer fence along the China/North Korea border. In southern Africa, a 500-kilometer fence separates Botswana from Zimbabwe. In Central America, a seashore fence cuts Guatemala from Mexico. Many barriers have been recently implemented in Europe, essentially to curb mass immigration from Muslim countries: see the current borders of Greece, Bulgaria, Macedonia, Hungary, Slovenia, and even Norway. A 3-kilometer fence has been built at Calais in northern France around the terminal of Eurostar, the French-British underwater high-speed train tunnel. However, enlightened citizens in Western democracies usually feel uncomfortable about wall-building -- especially when their own countries are concerned. Individual freedom and individual achievement are the Western world's most cherished values: it is all the more difficult to admit that they have a dark side, that more freedom to pursue happiness may entail more freedom for evil people to follow their evil ways. That mass immigration without acculturation may bring about about societal disruption, with equally bad consequences for the autochthonous population and the newcomers. Evidence about the dark side is getting overwhelming, however. There is accordingly a growing feeling that barriers may actually be needed, at least as a transitory option, and that, as such, they are fully legitimate. Border security in the West lags behind the surge of walls, fences, gates and security checks within borders. In fact, the whole discussion about border barriers pales once proper attention is given to the surge of walls, fences, gates and security checks of any kind within our own borders. Some of us may remember a time when there were no security checks on domestic flights, and when security checks on international flights amounted to no more than passport or customs control. Today, it is properly unthinkable to not to be checked, and screened, and profiled, even for a short domestic shuttle between two neighboring cities. The reason for such a transformation is not a declining interest in individual freedom, but a rising concern about individual and collective safety due to increasing numbers of airline hijackings, bombings, and suicide attacks. More often than not, the same is true about other forms of public transportation. All manners of checks are now routinely operated on rapid trains in Europe, like TGV in France. Passengers and luggage are checked on all train and long-distance buses in Israel. Random inspection is commonplace even on regular bus and underground lines in Europe and Israel. Similar considerations prevail about access to public buildings and even to public spaces. Electronic access control or bag checking is ubiquitous at museums, department stores, and government or business facilities in most developed nations. Many public facilities are surrounded by permanent metallic barriers or concrete cones. This has been the case for years at American embassies or Jewish facilities, including synagogues. In the wake of terrorist truck and car attacks against pedestrians, like the massacre in Nice on July 14, 2016, more barriers and concrete cones are being installed in tourist areas. Meanwhile, street or highway monitoring cameras keep a record of pedestrians and cars alike. 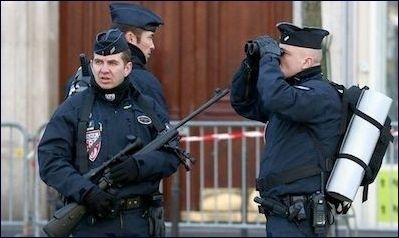 Paris has witnessed a vastly increased security presence in the last two years. State of siege measures are now a quite frequent occurrence. After the terrorist attacks in Barcelona last summer, many monuments, streets, and public spaces -- including coffee shops and restaurants -- were momentarily closed in other European cities. In Paris, where I live, it was forbidden to drive or even to walk in front of or around the Notre Dame Cathedral. Armed personnel of all kinds and of both genders were patrolling (the ordinary police, the CRS or anti-riot police, the Gendarmerie nationale or national constabulary, and the regular army), all of them heavily equipped with bulletproof jackets, guns, and even fully automatic guns. In places where traffic was allowed, security personnel randomly stopped private cars and trucks for inspection. And what about private housing? Until recently, walls and gates were not a common feature in well-to-do American suburbs. Things may be changing in this respect, with the rise of gated community projects. Likewise, the gates of most residential buildings used to remain unlocked or even open during daytime in post WW2 Paris; Parisians had no qualms then about leaving their apartment keys under the doormat. From the 1970s on, new dispensations were introduced: "digicodes" or digital locks became ubiquitous. Paying a visit to friends or relatives in 21st century Paris frequently entails passing through one or several digitally operated gates. The West Bank barrier has enabled Israel to reduce terrorist infiltration from Palestinian areas to virtually nil. It stands to reason that border barriers and home security are but two faces of the same coin. The true question is how much border barriers help alleviate the burden of security within borders. In my opinion, the answer is very much. European nations, and France in particular after the jihadist killing spree of 2015-2016, are learning a lot from Israel. There, comparatively high levels of home security have been achieved without infringing personal liberties or even creating a pervading climate of fear and suspicion. One important reason for this Israeli success is the implementation of comprehensive networks of border barriers.